The Write Question is a weekly video podcast all about writing. Today’s question is about juggling different types of writing. If you have a question you’d like me to answer you can email me at daphne@publicationcoach.com, tweet me @pubcoach, or leave a message for me at the Skype account, The Write Question. 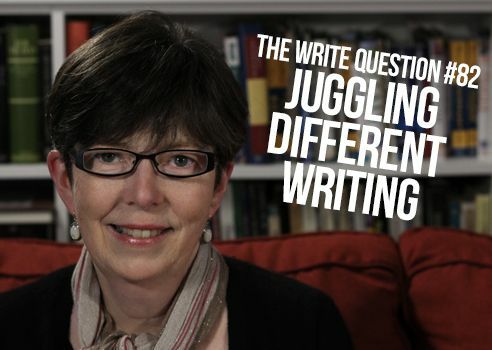 Welcome to The Write Question, I’m Daphne Gray-Grant and my topic today is juggling different types of writing. I have a question from Carla Fehr a university professor based in Waterloo, Ontario. Here’s what’s she’s asked. How does one manage multiple writing assignments? How does one jump from one genre to another? Thanks for your questions, Carla. I face almost exactly the same challenges myself. I blog five days a week but I also write papers and reports, I’m finishing up my next book and I do some writing for clients as well. These “assignments” are all very different from each other and require different voices and approaches. It’s challenging! That said, I think your real question is: how can you fit in blogging when you have so much other writing work to do. So I’m going to start with some reflection on that issue. In my 40 years as a writer, I’ve learned that if I want to accomplish something for CERTAIN, I need to do it first thing in the day. This is even more true if the work is difficult or challenging to me. The earlier in the day I start it, the more likely I am to accomplish it. Each day, I prepare a calendar for myself. I have a Word Document containing a table in which the day is divided into half hours. I schedule my various writing tasks into those half hour segments. Now, I’m not a machine, so scheduling something doesn’t mean I necessarily accomplish it. Just like everyone else, I get distracted and I make mistakes. But I find I generally accomplish the tasks I schedule for the morning. Here’s another trick: As a matter of policy, I never schedule anything that’s urgent — and by that I mean something I truly MUST complete by the next day — for the morning. Why? Because I know the urgency of the task will be enough to persuade me to do it in the afternoon. I save my mornings for IMPORTANT tasks, when I have plenty of energy and enthusiasm. For example, I spent 30 minutes on my book this morning. There’s no deadline attached to it but the book is important to me so I make it a daily priority. I think most of us believe that we always need to do urgent tasks first. But I think the reverse is true. We should do the important tasks first. I’ve written a blog post about this topic and I include the link below. In your case, Carla, I suggest you consider your blog an important task, and do it first, in the morning. Schedule it in your calendar. Then, you’ll have the rest of the day to deal with your urgent matters. Now, let me address the question of tone. This issue is more important than many people realize. Readers are instantly turned off by a tone or style that seems inappropriate to what they expect to read. If you review a bunch of blogs, for example, you’ll notice that the style is deeply different from anything you’ll find in a peer-reviewed journal. Or for that matter, in a business memo or white paper. Here’s what I suggest you to do wrap your mind around those differences. First, spend a couple of hours identifying MODELS of writing you would like to emulate. Find the best blog you’ve ever read. And the best business email. And the best business memo. And the best white paper. And the best article from a peer reviewed journal. Put all of these models together in a file that you store on the desktop of your hard drive, so it’s really easy to find. THEN, every time before you write, spend five minutes reading the “best” example of the genre you’re going to be writing in. Maybe read it aloud so the author’s style becomes really obvious to your brain. You could also spend five minutes copying from this piece. See the link to my blog post on copying, below. However you do it, you want to imbue yourself in a particularly effective example of the style of the genre. Don’t skip this step! It won’t take you long. Just five minutes. But it will help you ensure that you’re changing your voice to meet the demands of the style in which you want to write. To summarize, it is possible to juggle a wide variety of writing genres and voices but it requires careful attention to detail and sophisticated time management. But if you pay attention to your goals, you’ll be able to do it. Thanks for the question, Carla! I love that quote from Miles Davis because of its double meaning. My son is a musician and I know how important it is for musicians to count when they’re playing. But the larger aspects of time management are equally important — and for writers, too. Manage your time effectively and you’ll be able to accommodate all sorts of different types of writing.